Technalon® covers, made with Kimberly-Clark's Evolution® 4-layer non-woven polypropylene fabric, provide maximum protection in all weather conditions. Often imitated, but never equaled, U.S. made Evolution fabric covers are used by millions of satisfied car enthusiasts around the world. Recent improvements include a stronger outer layer and softer inner layer. The inner layer is constructed with similar processes used for our Dustop™ interior storage covers - gentle protection for fine paint finishes (inner layer is now light gray). Through extensive testing in Florida K-C has confirmed Evolution has the highest UPF rating of all their non-woven fabrics. This is important because UV rays are what damage both the exterior AND interior of any vehicle. Block the UV rays - protect the vehicle! 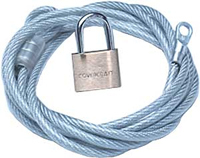 This kit consists of a plastic coated hardened steel cable and a brass padlock with keys. Simply loop the cable underneath the car and pass the ends through the reinforced grommets found on both sides of the cover. Take the guesswork out of finding TDC with this handy positive-stop tool when centerlining cams. This tool, made of hardened steel, is extremely accurate and can be used on all Chrysler engines except for 2.4L Turbo engines. For center lining camshafts. 0-180-0 degrees. Instructions printed on backside. This popular assortment includes 1 blue strip for 0.004"–0.009" clearances, 2 red strips for 0.002"–0.006" clearances, and 2 green strips for 0.001"–0.003" clearances. Each strip is 12" long. Special hardened steel Oil Pump Priming Shaft fits on any 3/8" or larger drill. Insert shaft into hole where distributor fits. Pressurizes oil galleys to ensure against dry starts and ruining your engine. Fits all V8 engines. 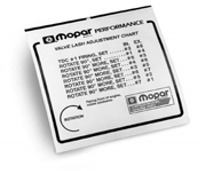 This self-adhesive chart can be mounted on a firewall or under the hood for quick reference. Indicates how to properly set valve lash with high-lift cams on V8 engines (8-position method). Te unique design of this mat allows you to consistently park in the same spot. 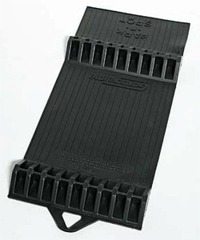 Made of black, non slip rubber material. Works for cars, trucks and vans. Sold individually. This is the tool used to install hog rings on seat covers. These are used to attach seat covers to seat frame.